Prof. Jachindra K Rout is the recipient of Poet of the year2014 by PQET INTERNATIONAL, Hyderabad, Editor’s Choice by Home of letters, BBSR, Kabi Kunja in Odisha, Gunduchimusa Samman, Cuttack, Ditiyabhanja Samman, Asureswar, Cuttack, Sathi Odisha Samman, Puri, Odisha. Abhipsa Samman, Cuttack, Madhulita Samman, BBSR, Odisha, Akhil Chakra KabitaSamman. Jajpur, Odisha, Navaprativa Samman, Odisha, Abhimanyue Samanta Sinhar Award 2000, Mahanga Gourava, in 2011, Barishree Samman, Jajpur, Odisha, Sahitya Darpan Samman, Dharmasala, Jajpur, Navajagarana Sahitya Samman, Chandikhole, Odisha and many more awards and felicitations. 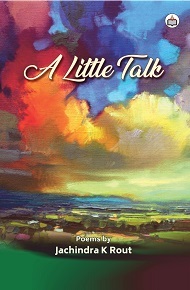 Many of his poems have been featured in International anthologies. He has published many books such as Wicked Eyes (poem) Kharavela (poem), Syamal Saransha (poem), Hatahauli (poem) Listen Silently (poem), Heart Throbbing (poem). Khndagiri and Udayagiri (historical), Views and Visions (criticism), Amanisanka Kabita (translated from Japan poems), Anatomy of Struggle, (translated autobiography) and Digahara Jiban Nouka RaKahani (edited the autobiography). Mr. Rout is widely published poet and columnist and having wide acclamations. He was born at Gobandia, Palai. Balichandrapur, Jajpur, Odisha, India. Now he is working as associate professor in English in BB Autonomous College, Chandikhole, Odisha.